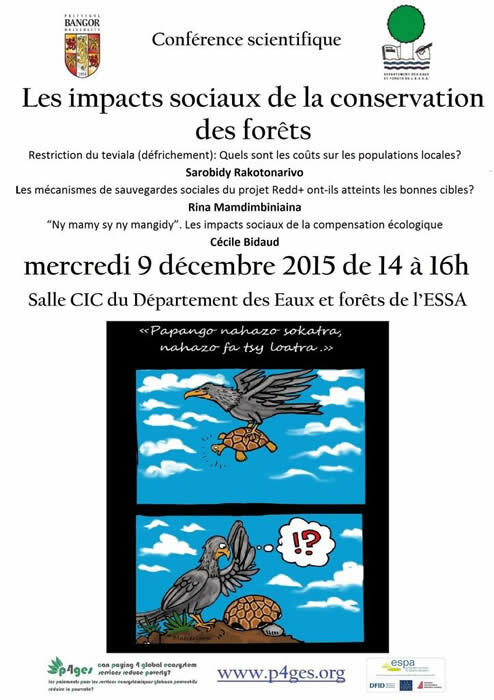 On Wednesday, December 9, 2015 the p4ges project organised a small conference on impacts and local costs of forest conservation at ESSA-Forêts. The event was well attended and about 40 students, academics, and partners from NGOs joined for the presentations and discussion. After three presentations from researchers associated with the p4ges project, which is financed by ESPA (see below for details of presentations), the chairman Patrick Ranjatson (researcher at ESSA-Forêts in charge of the institutional analysis p4ges component of the project) led a debate on environmental justice. Before the conference we distributed three questions to the participants. These questions focused on distribution options and types of compensation. Question 1: Who should receive the most benefits from conservation projects locally? Question 2: What should be the compensation? 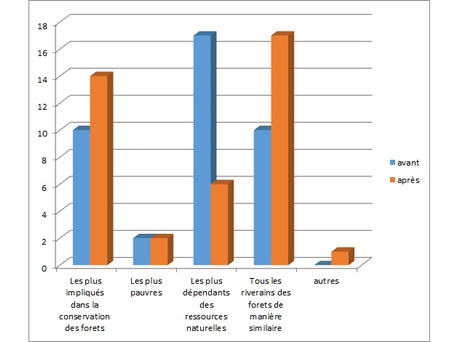 Question 3: What is the best approach to forest conservation in Madagascar? The responses helped structure and stimulate debate on these issues. At the end of the discussion the same questionnaire was distributed. It was interesting to see that many of the responses had altered: evidence that participants changed their views during the discussions on these complex issues. "who should receive the most benefit? "